We’d love your help. Let us know what’s wrong with this preview of The Wild Book by Margarita Engle. To ask other readers questions about The Wild Book, please sign up. I love Engle's verse novels of Cuban history and this one is based on her grandmother's experience growing up with "word blindness" or dyslexia as we know it today. A blank book, a gift from her mother, helps the girl have a place to explore language. A wild book. My sixth grade girls keep raving about this at our book club so I had to get to it. They are right. It is lovely. no longer sounds like a hiss. Funnily enough, I struggle with reading verse-novels, but it didn't take long for me to be drawn into Fefa's story. The setting is beautifully shared and learning more about the characters as Fefa's strength and confidence in her own writing grew was great. A book, written in verse, talking about the struggle a young girl with dyslexia faces with words each day. Each page is another entry in her book that shows the progression of her struggle. I am excited to share this book with my middle school readers to give them a unique perspective on dyslexia set in the backdrop of Cuba. Fefa cannot read because she suffers from "word-blindness" or dyslexia. Her mother gives her a blank book to write her own words. Scrawling her wild words into the book gives Fefa growing confidence and provides her insight that saves her family at a crucial moment. Based on Engle's grandmother's childhood experiences growing up during the chaos after Cuba's fight for independence from Spain. No one in my family Fefa cannot read because she suffers from "word-blindness" or dyslexia. Her mother gives her a blank book to write her own words. Scrawling her wild words into the book gives Fefa growing confidence and provides her insight that saves her family at a crucial moment. This book is about the author's grandmother who grew up in Cuba in 1912. She has dyslexia and tries to get her words out with poems and uses this to tell her story. I really like the idea of this book and the subject matter but to be honest I got kind of bored about half way through and lost interest. Finally I got tired of seeing it on my shelf so I decided to finish it. Not sure who I would recommend it too? It was okay, I'd give it 2 1/2 stars if we could give 1/2 stars. The main character, Fefa, struggles with dyslexia (the book uses the term from the time, word-blindness) and is also a hero. The book offers an interesting glimpse into how people lived with dyslexia in times where there was less understanding of the disability and fewer resources available. The book takes place in 1912, during Cuba's first years of independence from Spain. It depicts some of the chaos and lawlessness of the time. I don't know much about this time period in Cuba, so I enjoyed reading about it. This book is also a love letter to poetry and the oral tradition. It is written in non-rhyming verse, with each poem functioning as a different "chapter". Fefa enjoys adivinanzas (riddles) and shares them in the book. Her mom is a fan of poetry who names two of her sons "Rubén" and "Darío", and several of the characters participate in a poetry-reciting contest. It brought back memories of my own Cuban grandparents sharing poetry with me. opens up, inside my mind. This book is a beautifully written free verse novel, and I felt like I had a better grasp on the struggle people with dyslexia have after I read it. I also learned about the situation in Cuba in the early 1900s, which I was completely unaware of before. I gave it four stars instead of five because I don't know that the format and lyricism will be as appealing to the young age of the readers it is geared toward as it is for me as an adult. This was a sweet book. The writing is not particularly brilliant or beautiful, but the story is interesting and told well, a fascinating glimpse of childhood in Cuba in somewhat recent history. Plus the story would be great for children with dyslexia because the main character is dyslexic and the story is written as if she is writing it, in short, simple verses that are less daunting than traditionally narrative formats for anyone who has trouble reading. Really sweet and lovely, but not super substantial. I wanted more poetry, and the plot point at the end felt thrown in. I think it just needed a bit more work. Still, you don't get to read much regarding Cuba. I just found this author but I'm really looking forward to what she is doing. 1912 - From Trinidad, Cuba, Fefa struggles with words. Through this beautiful quick book, she begins to see beauty and patterns as she heads into her 12th year. I'm so glad a student turned me on to this author. I loved the cover (snatched it up in the library just because of it!) and the concept behind the book as well (dyslexia, grandmas story, Cuban characters..). I thought the execution was just okay. Beautiful, brief book in free verse, based on the author's grandmother's formative years in Cuba and her efforts to learn reading and writing as a dyslexic learner. A charming poem-cycle about a young girl in turn of the century Cuba with dyslexia who learns to love words. This book was cute and it had a powerful message. I love how it was written in verse. This was a simple read, but several words would be difficult for younger children who have dyslexia. I loved the simple story woven through the book. Margartia Engle writes the most beautiful novels in verse. In The Wild Book she draws on her family history to tell the story of Fefa who is dyslexic. I think this alone makes the book worth having on the shelf for the one or two kids who struggle with dyslexia and need to see themselves and their struggles in the pages of a book. Fefa is bound and determined, but constantly discouraged by her lack of progress, and I think she could be a very relatable character. I can’t speak to how accurately Margartia Engle writes the most beautiful novels in verse. In The Wild Book she draws on her family history to tell the story of Fefa who is dyslexic. I think this alone makes the book worth having on the shelf for the one or two kids who struggle with dyslexia and need to see themselves and their struggles in the pages of a book. Fefa is bound and determined, but constantly discouraged by her lack of progress, and I think she could be a very relatable character. I can’t speak to how accurately the disability is presented, but Engle does appear to have drawn directly out of family stories about her so I suspect she is pretty close to accurate in depicting her great aunt. The story beyond Fefa is interesting, but fairly quiet. Fefa is growing up in a small village with a large family. They are squabbles and mean sisters. One brother ends up injured in a pretty severe accident and becomes Fefa’s teacher. He isn’t particularly sensitive to Fefa’s difficulty reading, but he pushes her and eventually she comes to appreciate how he is helping her. There is some sense of danger in the book precipitated by historical events that might pique kids’ interest, but the tension is fairly low in the book itself. Kids who like quite books will enjoy this story. I don’t see the kids picking these up off the shelf on their own too often (I like the cover, but I’m not sure it appeals to kids), but to me that means we need to do a better job of talking them up and drawing attention to them. I’ve said many times, novels in verse (and graphic novels) are good alternative formats that work well for reluctant readers. This one even more so because some of those reluctant readers may be struggling with a learning disability that makes reading difficult. Fefa struggles with words. She has "word blindness", or dyslexia, and the doctor says she will never read or write. Every time she tries, the letters jumble and spill off the page, leaping and hopping away like bullfrogs. How will she ever understand them? But her mother has an idea. She gives Fefa a blank book filled with clean white pages. "Think of it as a garden," she says. Soon Fefa starts to sprinkle words across the pages of her wild book. She lets her words sprout like seedlings, shaky a Fefa struggles with words. She has "word blindness", or dyslexia, and the doctor says she will never read or write. Every time she tries, the letters jumble and spill off the page, leaping and hopping away like bullfrogs. How will she ever understand them? But her mother has an idea. She gives Fefa a blank book filled with clean white pages. "Think of it as a garden," she says. Soon Fefa starts to sprinkle words across the pages of her wild book. She lets her words sprout like seedlings, shaky at first, then growing stronger and surer with each new day. And when her family is threatened, it is what Fefa has learned from her wild book that saves them. In this vibrant novel in verse, award-winning poet Margarita Engle paints a glowing portrait of her grandmother as a young girl. Cuba -- History -- 1909-1933 -- Fiction. Additional note: The Wild Book by Margarita Engle. It is without doubt that Margarita Engle has composed a beautiful story, but the majority of readers will be unaware of the true genius that lies between the covers of this book. That is because most who will read this are not dyslexic. It is without doubt that Margarita Engle has composed a beautiful story, but equally impressive is the thought that has been made in the construction of this book. As you may know, many people with dyslexia have difficulty with visual scanning and tracking the written word while reading. This makes reading challenging and at times stressful. In creating her newest book, Margarita Engle has not only constructed a beautiful story, but she has placed great thought to several physical characteristics of the book itself. These details might seem odd to some, but for those with dyslexia, they make the process of reading more enjoyable. Everything from the physical size of the pages, the clear font, and the wide spacing between lines support the needs of all readers. Truly Brilliant! Told in poems, this is the story of Engle’s maternal grandmother and her struggle with dyslexia. Known as Fefa, her grandmother was diagnosed with “word blindness” and told she would never read or write. Luckily, Fefa’s mother has an idea. She gives her daughter a blank book to fill with words, as if she is scattering wildflower seeds on the ground. At first Fefa’s words are hesitant and stilted, like seedlings. But steadily her writing and reading improve as she learns to take her time and gain Told in poems, this is the story of Engle’s maternal grandmother and her struggle with dyslexia. Known as Fefa, her grandmother was diagnosed with “word blindness” and told she would never read or write. Luckily, Fefa’s mother has an idea. She gives her daughter a blank book to fill with words, as if she is scattering wildflower seeds on the ground. At first Fefa’s words are hesitant and stilted, like seedlings. But steadily her writing and reading improve as she learns to take her time and gains confidence. And that reading is what saves her and her siblings from being kidnapped in the chaos following Cuba’s fight for independence. Engle writes a gripping series of poems that range from celebrating the written word to the difficulties of dyslexia to the triumph of overcoming. Over the entire book the threat of violence and kidnappings hangs low and dark. It is clear that this is not a modern story from the very beginning and Engle cleverly reveals the extent of the chaos the family is living in the midst of through Fefa herself and her own growing knowledge. Engle traces the love of words and poetry Fefa’s own mother, who shares poems with her family. It’s a beautiful celebration of that history and those words. 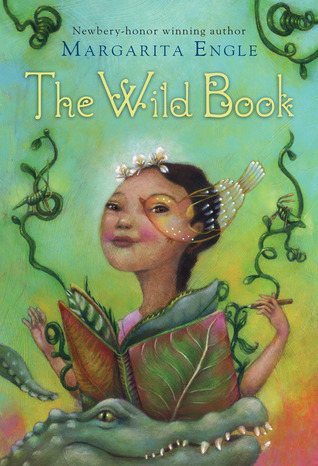 The Wild Book is a novel in verse by two-time Pura Belpré winner, Margarita Engle. This fictionalized account of her grandmother’s struggle with dyslexia takes readers to Cuba, 1912. While the book is fiction, it is inspired by the stories Engle heard from her grandmother. This story is rich with history, emotion, and determination. Fefa, short for Josefa, is about 11 years old when she is diagnosed with “word-blindness” by the village doctor. He tells her mother that she will never be able to The Wild Book is a novel in verse by two-time Pura Belpré winner, Margarita Engle. This fictionalized account of her grandmother’s struggle with dyslexia takes readers to Cuba, 1912. While the book is fiction, it is inspired by the stories Engle heard from her grandmother. This story is rich with history, emotion, and determination. Fefa, short for Josefa, is about 11 years old when she is diagnosed with “word-blindness” by the village doctor. He tells her mother that she will never be able to read or write, but Fefa’s mother doesn’t give up on her daughter’s education. Fefa’s mother loves sharing poetry with her family. She gives Fefa a blank book and tells her to think of it like a garden; she can plant the wildflower seeds of her words anywhere on any page. Fefa’s writing and reading improve, but word-blindness is only one obstacle in her life. One of her brothers has an accident while hunting caiman. He can no longer be a farmer, so he decides to tutor Fefa as practice for his new profession: teaching. A middle-aged farmhand takes an interest in young Fefa. He writes her notes and says unwelcome things when no one else is listening. Fefa is very frightened of him, but tells no one. Then one day she finds a ransom note saying that if her father does not pay so much per child, notorious bandits will kidnap them. Her parents have so many children that they can’t afford to pay for all of them and her father refuses to choose which ones he will buy the safety of. But Fefa’s reading ability and close attention to detail save the day when she recognizes the handwriting. This novel is a great way to include international and multicultural studies. The novel in verse format makes this a quick and accessible read. It is also well suited to be read aloud by a class or teacher. Fefa is often frightened that her teacher will call on her to read aloud, so this could lead to a class discussion about respecting others when reading out loud for the class. FTC Disclosure: I received an Advanced Reader's Copy of this book from the Amazon Vine Program in exchange for an honest review. Summary: Fefa struggles with words. She has word blindness, or dyslexia, and the doctor says she will never read or write. Every time she tries, the letters jumble and spill off the page, leaping and hopping away like bullfrogs. How will she ever understand them? But her mother has an idea. She gives Fefa a blank book filled with clean wh FTC Disclosure: I received an Advanced Reader's Copy of this book from the Amazon Vine Program in exchange for an honest review. Summary: Fefa struggles with words. She has word blindness, or dyslexia, and the doctor says she will never read or write. Every time she tries, the letters jumble and spill off the page, leaping and hopping away like bullfrogs. How will she ever understand them? But her mother has an idea. She gives Fefa a blank book filled with clean white pages. "Think of it as a garden," she says. Soon Fefa starts to sprinkle words across the pages of her wild book. She lets her words sprout like seedlings, shaky at first, then growing stronger and surer with each new day. And when her family is threatened, it is what Fefa has learned from her wild book that saves them. When I first read the description of this book I was eager to read it. Recently, my school has put into place to programs to help dyslexic students. I was hoping this would be a great resource for those students. Sadly, I was disappointed. The story is about an 11 year old girl with "word blindness" who receives a book with white pages to write her thoughts as a way to work her way through the challenges of being dyslexic. A great idea, but it doesn't live up to it's potential. I'm not sure who the target audience is. Is it students who face these challenges. Is it parents or educators who work with dyslexic students? Amazon recommends the book for ages 10 and up, but based on my experience with my students, I believe it would be not only a difficult read, but one that would not appeal to very many of them. Older students and adults will be more suited to appreciating the beautiful word play and verse format. This is based on the stories that Margarita Engle’s grandmother told of her childhood. It is written in free verse form. Fefa struggles in school because of reading and writing. The words do not seem to make sense to her. She says that they slip and jump away like frogs. The doctor says that she has word-blindness and will never be able to read or write. Fefa’s mother disagrees and gives Fefa a blank book to fill with her own words. Fefa begins writing in it nearly everyday. Through this, she begins to feel more confidence in her reading and writing. Outside of her reading and writing, there are other dangers about Fefa. Cuba is a lawless place where bandits are stealing children for ransom. Everyone is scared of the possible danger. When the family is threatened, they do not have enough money to pay for all of the ransoms, but Fefa’s book helps her solve the family’s troubles. She becomes the heroine, even with her struggles in reading and writing.